Come join the fun! 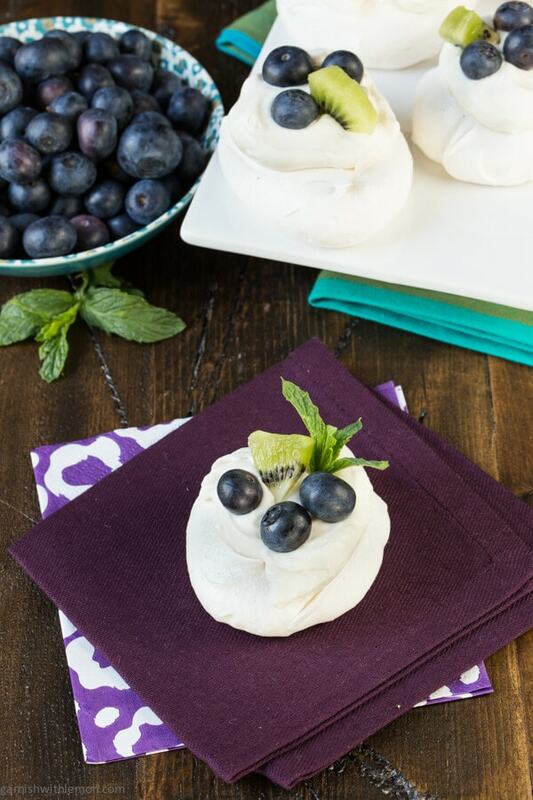 We’re celebrating the arrival of a special baby boy today with these Mini Pavlovas with Blueberries and Kiwi. My first baby just turned twelve (What!?! How did that happen?? ), but I can still recall the wave of emotions I felt anticipating her arrival. Little did I know that bringing her into this world was just the start of the emotional rollercoaster that parenthood is, but there is nothing I’d rather do than be a mom to my two babes. Which is why we are so excited to help celebrate the arrival of another blogger’s first bundle of joy. Taylor of greens & chocolate will welcome a baby boy next month. Lisa and I first met Taylor and her husband a few years ago at a foodie event here in Minneapolis. Such a cute, down to earth couple! We know they will make great parents. So how does a food blogger honor such a momentous occasion? 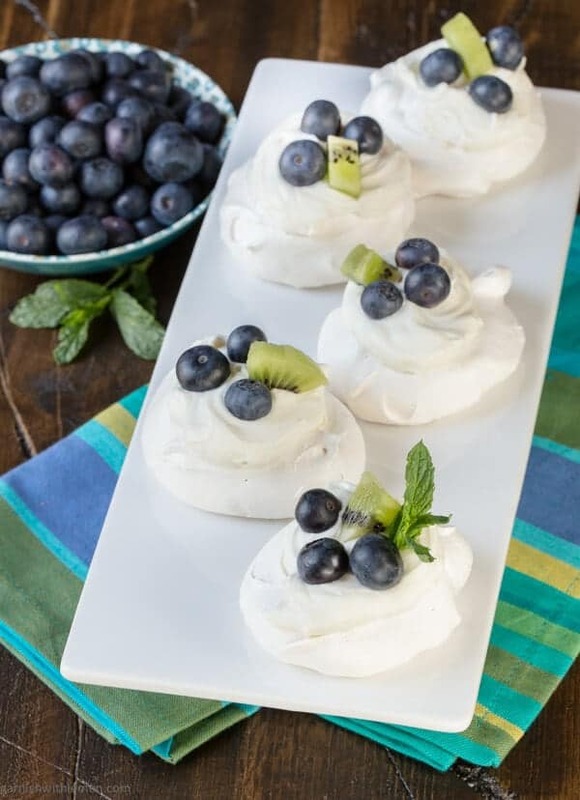 With Mini Pavlovas with Blueberries and Kiwi, of course! Don’t be intimidated by these little beauties. Yes, they look kinda fancy, but the ingredient list is short and most of the work is done with your handy stand mixer. A pavlova is simply a meringue-based dessert with a crispy exterior and a delightfully soft, marshmallow-like interior. It was originally created in honor of the Russian ballerina, Anna Pavlova, for her tour of Australia and New Zealand in the 1920s. Most pavlova recipes are topped with whipped cream, but I upped the decadence factor just a bit and added cream cheese to my whipped cream. The choice of fruit is entirely up to you, but blueberries and kiwi (blue and green) seemed like solid picks to honor a baby boy. Tip: After the pavlovas have baked and cooled, you can store them in an airtight container for up to 24 hours. You can make the cream cheese whipped cream in advance, too, and simply assemble right before guests arrive. Yay! Bonus points for any recipe that can be prepped ahead of time! Preheat oven to 300 degrees. Place oven racks in the bottom third of the oven. Line 2 baking sheets with parchment. Set aside. Beat egg whites in a stand mixer with a whisk attachment until foamy. Slowly pour in the sugar and beat on medium high speed for about 10 minutes or until firm glossy peaks appear. Beat in the vinegar, vanilla and salt. Sprinkle the cornstarch over the egg-sugar mixture and gently fold it in. Place a heaping spoonful of the meringue mixture on the baking sheet. (You're aiming for 2 1/2 - 3" in diameter.) Repeat until you have approximately 16 meringues total. Use a clean spoon to create a small well in the center of each pavlova (for the cream cheese whipped cream). Smooth the sides of the pavlovas, if desired. Place baking sheets in the oven and lower the temperature to 225 degrees. Bake for one hour, rotating pans halfway through. After one hour, turn off the oven and prop the door open with the wooden handle of a spoon or spatula. Allow the meringue to cool in the oven for 30 minutes, then remove pans and allow to cool completely. Beat cream cheese in a small bowl until soft and no visible lumps remain. Beat the whipping cream on high speed in a medium sized bowl until soft peaks form. Add the cream cheese to the whipped cream and whip on high until stiff peaks form. Gently beat in the sugar and vanilla. Keep refrigerated until ready to use. Place a dollop of cream cheese whipped cream on each pavlova. Top with blueberries and sliced kiwi. Pavlovas are always a delicious treat, and these are no exception! Thank you so much for participating in the shower for Taylor! Such fun, Mackenzie! Thanks for including us! I love these light and summery treats!! I’m all about the summer foods these days, Liz. Bring it on! Thank you so much for such a sweet baby shower!! These little treats look delicious – perfect for spring and summer! I don’t think I’ve ever tried a pavlova but clearly that needs to change! Love the combo of bluebs and kiwi here! I couldn’t resist the baby boy colors, Steph! These are so pretty! I love the blueberry and kiwi combo, yum! Thanks, Sarah. Ideal colors for a sweet little boy! I’ve never made or eaten a Pavlova, but these are so stinkin cute! PINNED! Thanks for the pin, Lee! These are beautiful! Perfect for a baby shower! I still have yet to make pavlovas at home – I need to fix that! These are so pretty! Thanks, Ashley! They really come together quickly. Exactly – almost too good to eat! Gotta have some sweets for a sweet little baby! I’ve made these for an Easter dinner dessert, and again for a brunch. They are so delicious! The second time I made them, I added lemon zest and a squeeze of juice from half a lemon when I was whipping the cream cheese, and I also replaced half the vanilla extract with lemon extract in the whipped cream topping. Just something I thought I’d try, and it turned out to be a nice complement to the sweet meringue. Thanks so much for the recipe! Definitely one I will be making again and again! Love these variations, Carolyn! So glad you enjoyed them!